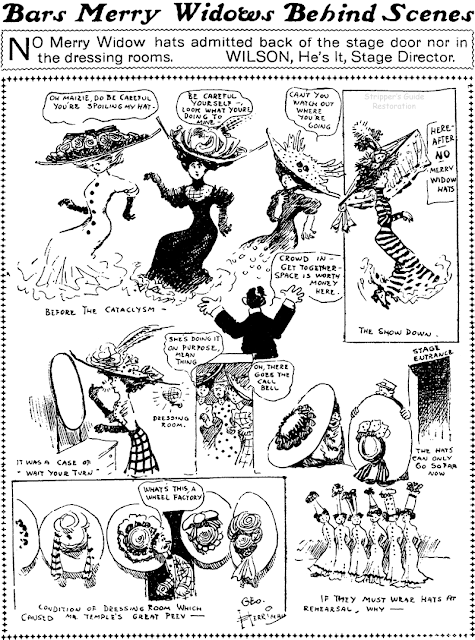 Thursday, April 30 1908 -- In the wake of the smash hit opera The Merry Widow, in which the subject of the title wears a very large and highly adorned chapeau, ladies all over are donning their own versions of the giant lid. A stage manager with the Temple Opera Company has had enough of the fad and banned the monstrosities from the theatre during rehearsals. After Herriman's yeoman service churning out multiple daily cartoons during fleet week, he seems to have been offered a rest, as for the next week he's off the sports page, contributing only one of these light items per day.